It’s the romance and story St-Germain is telling with this bike that has us clicking “fav” on it and like. It’s spec’d with Jesse’s Bicycle Wine Rack. 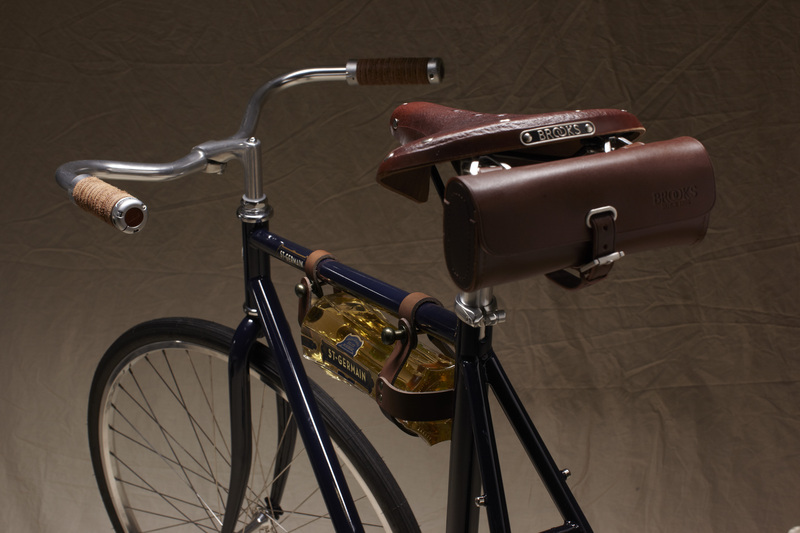 Where we’d like to see this bike, besides on a bike path heading to a holiday party? In a quiet, local restaurant, away from the tourists, along the coast somewhere like La Rustica near us. Feature it with a special drink, catch of the day, and a bread basket too. Paused at that 1K, limited edition price? Sure you could make your own Holiday Whip with any old single speed and grocery bag dangling from the top tube with a six pack in it. On the other side of the party bike spectrum is the Hodala crew and what Raleigh’s Sally did with single speed cross bikes. The bike is connector in a Martha Stewart gourmet kitchen or dive bar. Pick your poison.